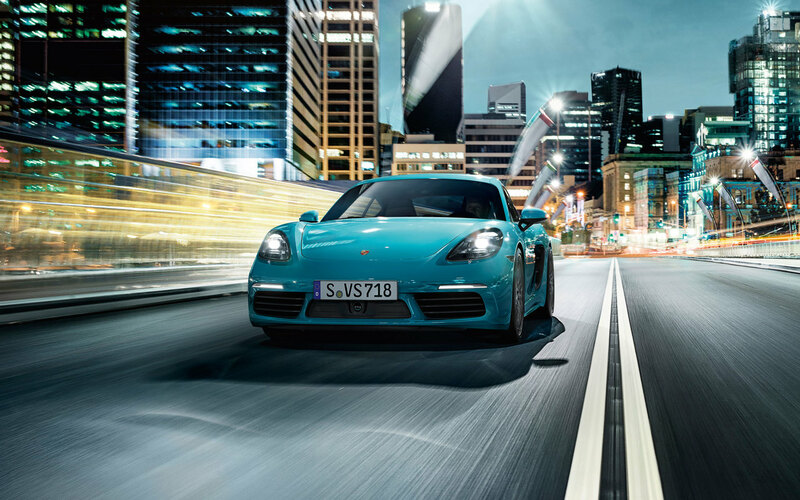 The Boxster and the new Cayman are the sequel that continues the 718 era. At their heart, a four-cylinder turbocharged boxer engine beats with the same fighting spirit that delivered countless podium finishes. In them lives the will to break away from standards. And to inspire conviction. So it is entirely appropriate that they, too, should bear these three digits in their name and carry the 718 legend forward. What is it that makes the 718 models so special? Their performance, their handling, their design and the generous amount of space afforded by two luggage compartments. Above all: a mid-engine layout that makes all this possible in the first place. The engine is positioned no further than 12 in. behind the driver. Effect number one: the resounding thump on the back. Effect number two: the extraordinarily dynamic cornering capabilities, thanks to the car’s low and central centre of gravity. The horizontally opposed arrangement of the engine’s cylinders also helps to reduce oscillations, which has a positive impact on smooth running. Another plus for driving dynamics: the concentrated power of the engine is transmitted directly to the rear axle. The side profile emphasizes the midengine layout. The wheel arches are large, designed for wheels up to 20 inches in size. 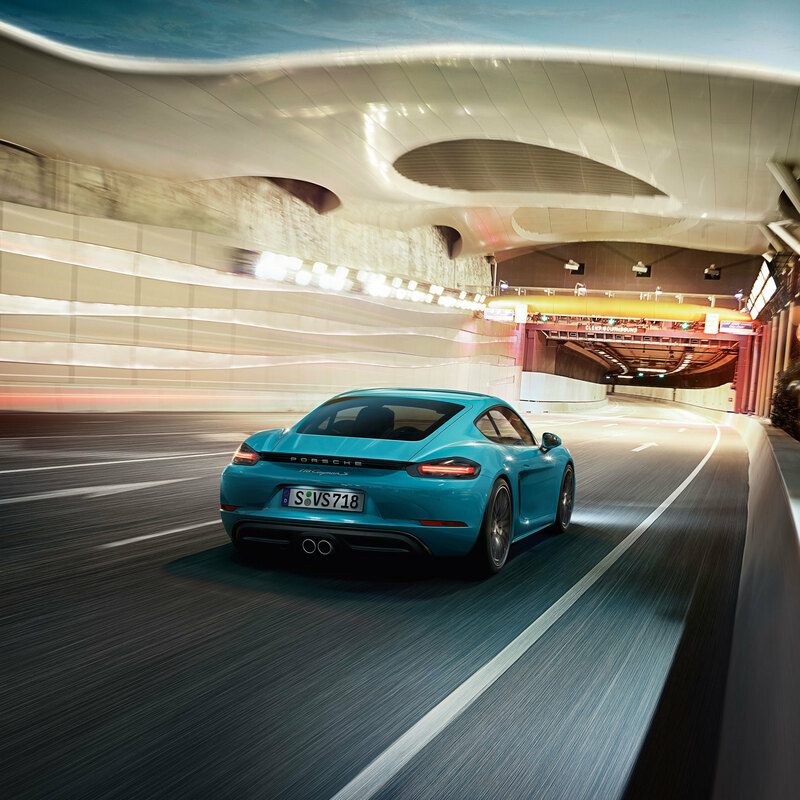 One thing is clear: the 718 models were not intended for the shelter of the garage, but for the pleasure of driving. That’s precisely why the contouring on the doors purposefully directs headwind into the large air intakes on either side of the car. This provides the optimum supply of air to the new turbocharged engines, a basis for their powerful forward thrust. The wing above extends automatically at a speed of 120 kph, reducing lift to provide even better roadholding performance. The new, fundamentally revised version of Porsche Communication Management (PCM) features a 7-inch multi-touchscreen. With its high-quality glass surface, it is the aesthetically pleasant addition to the centre console. All ideal prerequisites for a sporty, active lifestyle. The details? They’re up to you. Choose from a comprehensive selection of personalization options and a new range of materials and colours. 2.0-litre turbocharged boxer engine producing 300 hp and 280 lb.-ft.
2.5-litre turbocharged boxer engine producing 350 hp and 309 lb.-ft. Creating more power is still no challenge. 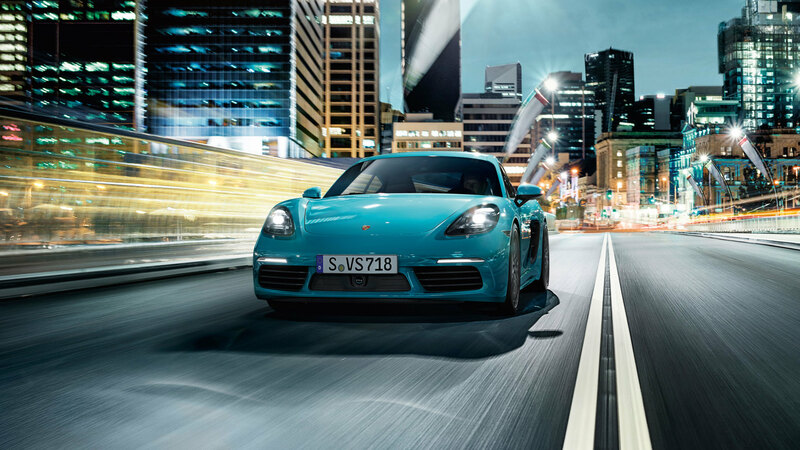 Not unless it’s done the Porsche way – by seeking to achieve moderate fuel consumption at the same time. The result is an increase of up to 35 hp and 309 lb-ft – together with increased efficiency. And the fun is only just beginning. The 2.0-litre turbocharged horizontally opposed engine. 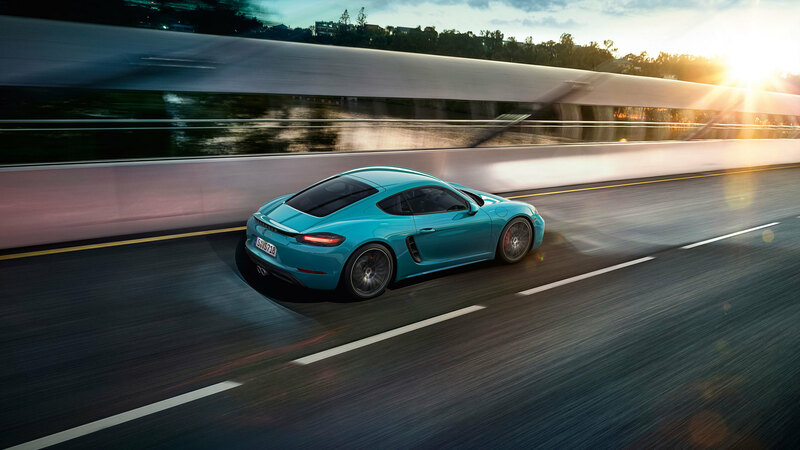 The 718 Boxster and Cayman are equipped with a 2.0-litre turbocharged horizontally opposed engine with direct fuel injection (DFI), VarioCam Plus and integrated dry-sump lubrication. The unit develops 300 hp at 6,500 rpm. Maximum torque is 280 lb.-ft. Thanks to turbocharged induction, it is available as low as 1,950 rpm and prevails until 4,500 rpm. 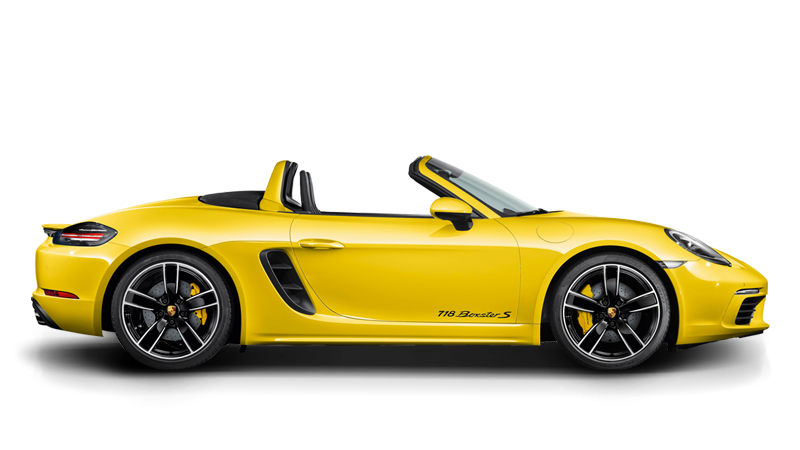 With Porsche Doppelkupplung (PDK), the 718 Boxster accelerates from 0 to 100 kph in only 4.7 seconds, reaching a top track speed of 275 kph. The 2.5-litre turbocharged horizontally opposed engine. 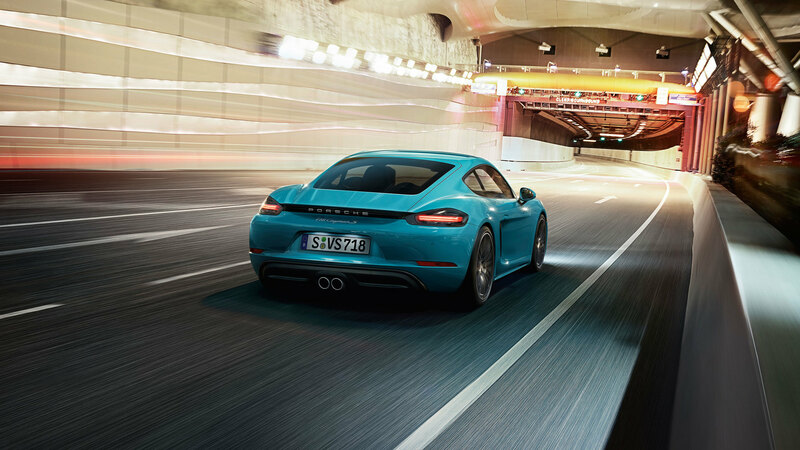 The 718 Boxster S and Cayman S draw its power from a capacity of 2.5 litres. The result is 350 hp at 6,500 rpm. The maximum torque of 309 lb.-ft. is available across an impressively wide range from 1,900 to 4,500 rpm. This engine – like the unit in the 911 Turbo – also comes equipped with variable turbine geometry (VTG). VTG provides an even more consistent delivery of power and, in turn, significantly greater driving pleasure. Propulsive potential? Top track speed is 285 kph. The 718 Boxster S with PDK and Launch Control completes the 0 to 100 kph sprint in just 4.2 seconds. 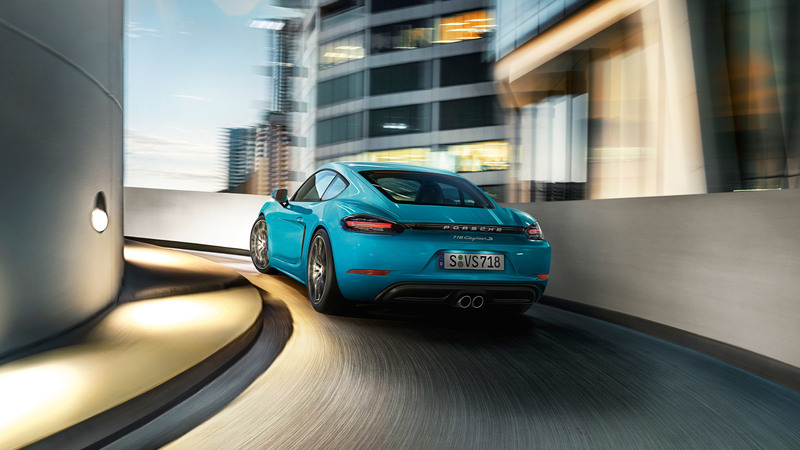 The displacement of the 718 Boxster and Cayman models has been considerably reduced. Nevertheless, the power output of the new engines has been significantly increased. This was made possible by the new turbo charger that was developed completely from scratch for the 718 models. The respective turbocharger is particularly compact and has been optimally adapted to the displacement and power output of the engine. The result could not deliver a clearer message. The extraordinarily wide torque plateau makes itself felt with each demand for throttle - barely 30 cm behind your back. After all, what is performance without intelligence? Auto start/stop switches off the engine when the driving speed falls below 7 kph, such as when you are approaching a red light. As soon as you release the clutch or depress the accelerator pedal, the engine restarts – swiftly and smoothly. 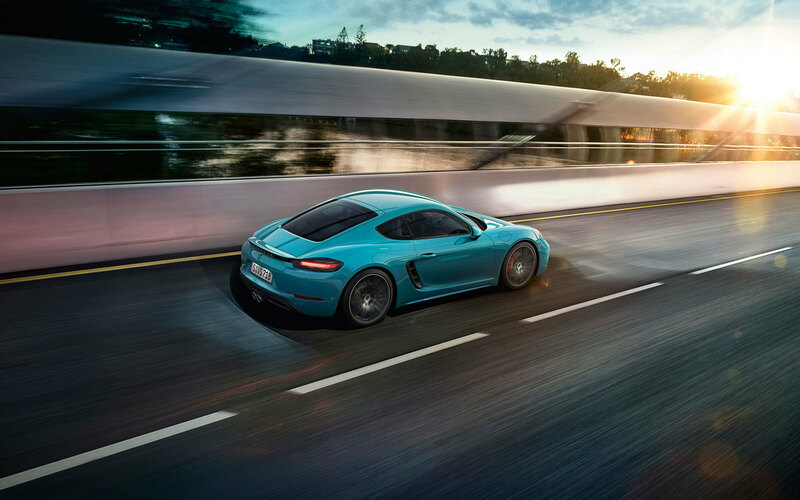 7-speed PDK, featuring both a manual and an automatic mode, is available as an option and offers extremely fast gear changes with no interruption in the flow of power; not to mention even faster acceleration performance and a reduction in fuel consumption over the manual transmission. Anyone can follow the straight and narrow. Only the corner is the true test of courage. Only in the corner does a sports car really become a sports car. So it’s all the more important to have a chassis that can master any sporting challenge. And be a match for the high power output of the engine. The suspension components are for the most part made of aluminum, which keeps the vehicle weight and unsprung masses low. The wide track, long wheelbase and specific chassis construction help to deliver particularly precise and agile handling. The comfort-oriented Power steering Plus is available as an option. At high speeds, the steering is as firm as you would expect. At low speeds, the steering ratio adjusts for easier manoeuvering and parking. 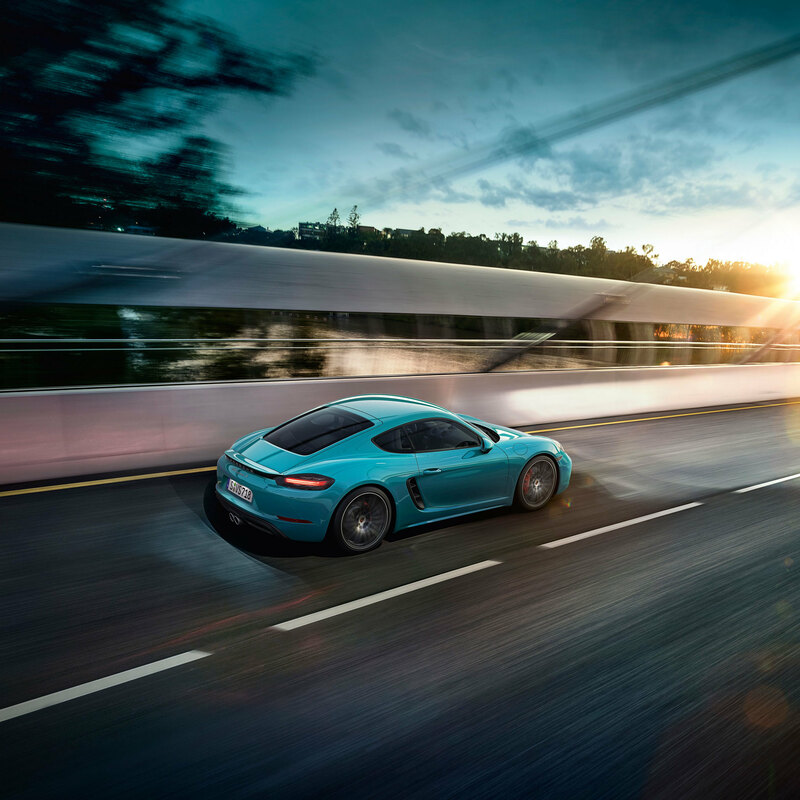 The new 718 Boxster and 718 Cayman models are equipped with enhanced Porsche Stability Management (PSM) – an automatic control system for helping to maintain stability at the limits of dynamic driving performance. 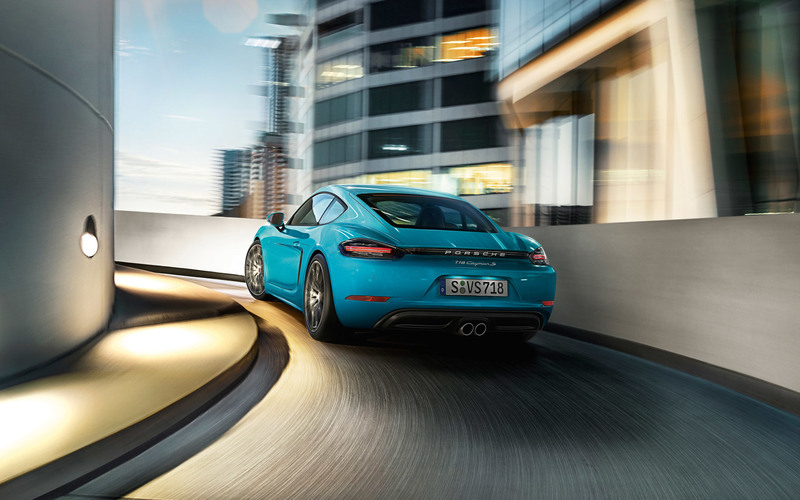 The 718 Boxster and Cayman models each come equipped with distinctively styled 18-inch wheels. The S models are fitted with 19-inch wheels introducing two new rim designs. Rolling resistance and tire weight are comparatively low.Tire Pressure Monitoring System (TPMS) improves safety. The second function is the motorsport-derived gearshift strategy. In this mode, PDK is geared up for extremely short shift times and optimum shift points for the maximum acceleration available. This combination of uncompromising and involving performance is ideal for the racetrack. In sport, performance counts. It applies to the engine and it also applies to the brakes. The 718 models are therefore equipped with four-piston aluminum monobloc fixed calipers. PCCB features six-piston monobloc aluminum fixed brake calipers on the front axle and four-piston units at the rear – all painted in yellow – to provide braking forces that are considerably more powerful and, crucially, are exceptionally consistent. One special feature of PDLS Plus is the dynamic High Beam Assistant function. A camera detects the lights of vehicles ahead as well as those of oncoming traffic. Based on the data from the camera, the High Beam Assistant then turns the high beams on and off accordingly. The new sport steering wheel with its puristic design, the ascending centre console, three round instruments with the tachometer positioned in the centre: everything in the interior is intended to put the driver first. All buttons and functions are intuitive to operate, all information is always ready at hand. The materials are no less suited to the sporty challenge. Leather and Alcantara® are easy to grip, while the firmly padded sport seats provide support during dynamic cornering manoeuvres. The sport steering wheel with threespoke design is lightweight and functional. The small centre pad and the chrome ring encircling the Porsche Crest – both derived from the steering wheel of the 918 Spyder – reinforce its sporty character. Comfort doesn’t have to be sacrificed. Neither does a sporty driving feel. The optional fully electric Sport seats offer power adjustment of seat height, backrest angle, seat cushion angle and squab depth. Also electrically operated are the fore/aft adjustment, four-way lumbar support and even the steering column. The included memory package stores a range of settings, including the positions of both exterior mirrors and all driver’s seat and steering wheel positions. Available as an option are Sport seats Plus in leather with electric backrest adjustment as well as mechanical height and fore/aft adjustment. The side bolsters on the seat cushion and backrest have a firmer, sportier padding and provide even better lateral support. Available on request, adaptive Sport seats Plus reinforce the connection between sport and comfort. As an upgraded version of the Sport seats Plus, they combine all the features of the fully electric Sport seats and add power adjustment of the side bolsters on the seat cushion and backrest. Seat heating is available as an option for all seats. Seat ventilation is also available on request (not for seats with seat centres in Alcantara® or Sport-Tex) – for a pleasant and dry seating environment, even in hot weather. In the interior, too, clever storage solutions offer plenty of space. The compartment under the armrest – when combined with the optional Connect or Connect Plus module and the included smartphone storage tray – becomes the ideal interface between your smartphone and your 718 model. Further convenience is provided, for example, in the form of two compartments in the doors, clothes hooks on the seat backrests and two practical cupholders above the glove compartment. New Lane Change Assist, available as an option, uses radar sensors to monitor the areas to the rear of the vehicle and the blind spots on either side. Above a speed of 15 kph, the system issues a visual warning signal in the door mirror panel whenever a vehicle rapidly approaches your vehicle from behind or enters one of your blind spots. In this way, Lane Change Assist improves comfort and safety, particularly on motorways. However, the system does not actively intervene to control the vehicle and can be deactivated at any time. Featuring four inconspicuous sensors at the front and four in the rear, standard ParkAssist audibly alerts the driver to the presence of obstacles detected in front or behind the vehicle. An intermittent warning tone increases in rapidity as the obstacle is approached. Sound Package Plus delivers excellent sound. 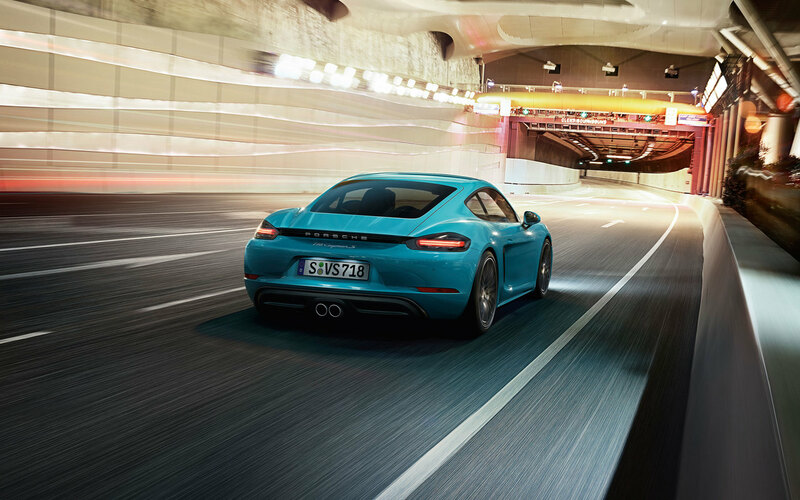 It comprises six loudspeakers and a total output of 110 watts in the 718 Boxster, and eight loudspeakers with 150 watts in the 718 Cayman. The amplifier integrated into PCM optimally adapts the acoustic pattern in the vehicle interior to the driver and passenger. The second app is the Porsche Connect app. 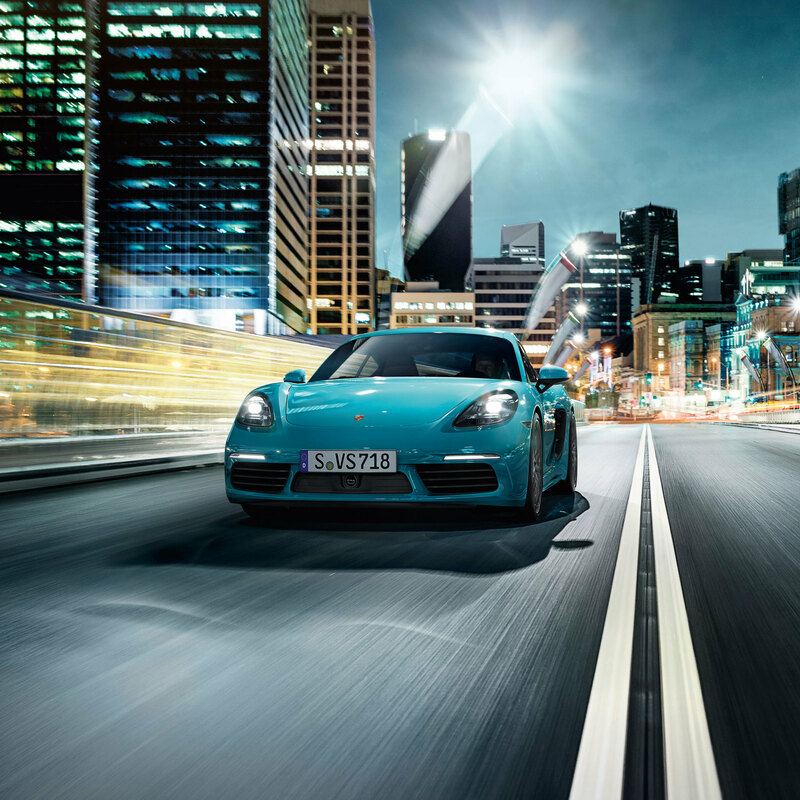 This allows you to send chosen destinations to your Porsche before you start your journey. As soon as your smartphone has connected to PCM, you will be able to display them in the vehicle and transfer them directly to the navigation system. Even your smartphone calendar can be viewed directly on PCM and stored addresses used for route guidance. 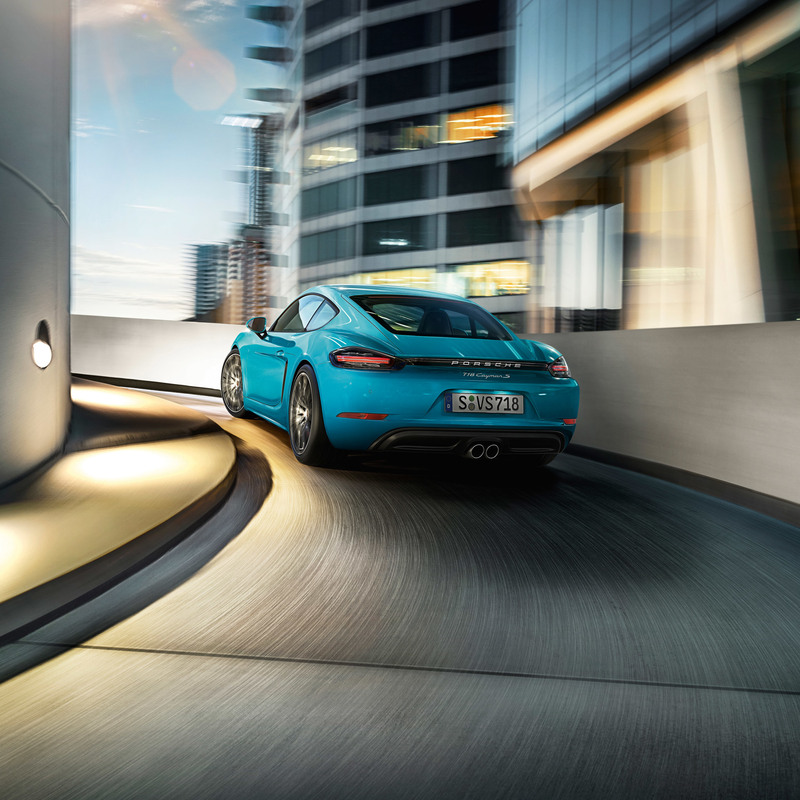 What’s more, the Porsche Connect app gives you access to millions of music tracks thanks to seamless integration with Napster®, a premium on-demand music streaming service. None of this would be possible without originality, inspiration and enthusiasm, beginning as early as the consultation stage. That’s because we keep in mind one thing above all else: your particular wishes and requirements. We fulfil them with composure and meticulous care, through precision handcrafting and the use of exquisite materials such as leather, Alcantara®, carbon, mahogany or aluminum.